I Am Involved – Are YOU? Mrs. Williams, I was looking for clarity on what the board was thinking with the decision to hire Mr. McMinimee. Do you see the hypocrisy in asking this question? Now, before you go and get all defensive. I have publicly stated you are a great advocate for your children and I believe you are a good mother. However, this post was meant to shame people. “Are you involved?” Asks a question but really says, “look at me, I am involved”. Now, let’s discuss your involvement. Would you care to share how involved you have been? I’m not talking about advocating for your own children. No one is disagreeing that you have and will continue to advocate for your children. I’m asking how have you been involved in your schools, present or former? And the big question how have you made improvements that benefited ALL the students or had absolutely no effect on your children. Example: I recently volunteered 5 hours in the 1st grade classroom to teach Junior Achievement. I do not have a child in 1st grade, I did it because I was asked and I believe it is a great program. Now, I think we can agree that I am am involved and I think we can also agree that my involvement directly affected your children in a positive way. 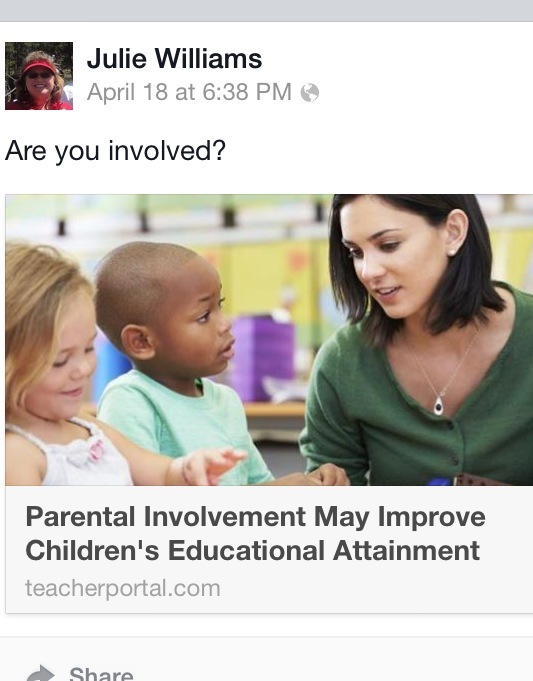 How has your involvement affected my children? I am worried about the direction Jeffco is heading and since I don’t have a GT student, special needs student or attend a charter school, I don’t think you are going to advocate for my children. I believe in ALL the students. I have used my involvement for the betterment of my kids lives, yes. But, I have always seen the big picture. I sponsored Student Council because my son was interested, but I led a group of 30 students who made big differences in the school. Did you know that the American flag, Colorado flag and the flags in every classroom were purchased by my student council, my Girl Scouts and the SGE PTA. I saw an issue (worn, faded, beat up flags) and fixed it. So, to answer your question. Yes, I am am involved. And, I don’t have to ask that question since we all know the ones that are involved. They are the ones that spend hours planning events, putting together yearbooks, writing checks to cover items the district can’t or won’t. We know who the involved parents are. It shows in the children who volunteer to run games at the community celebration. Purchase books for library. Never ask if “they are getting paid” when they are asked to volunteer. It shows in classroom, those are the families that show up. Guess my question to you is, are you involved? And follow up, when it involves the 85,000 students of Jeffco? The big difference between you and me is I am involved when it goes beyond my two children and to quote someone, “I’m just a mom”. I am not part of the Board of Education. At the end of the day, whose involvement has made a positive impact on the students of Jeffco? Involved Parent, PTA President (former Secretary, Fund Raising chair), Former Student Council Sponsor, Yearbook Club Advisor, Girl Scout Leader, Junior Achievement Volunteer and the first to sign up. PS-all done while holding down a job.